Tripp Lites Mode Conditioning Cables are designed for use in Gigabit Ethernet 1000BASE-LX applications. N425-Series cables convert a Singlemode LC GBIC to an SC Multimode patch bay. They are fully compliant with IEEE 802.3z application standards. Mode Conditioning Cables are needed in applications where high-speed Gigabit 1000BASE-LX routers and switches are being deployed into existing Multimode plants. 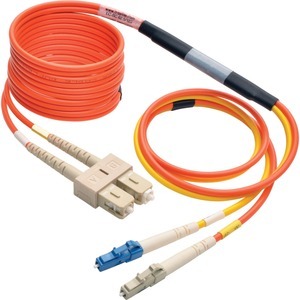 The need for this patch cord is due to the single-mode launch nature of the -LX or long-wave (1300 nm) transceiver modules used for Gigabit Ethernet. Launching a single-mode laser into the center of a multimode fiber can cause multiple signals to be generated that confuses the receiver at the other end of the fiber. These multiple signals, caused by Differential Mode Delay (DMD) effects, severely limit the cable distance lengths for operating Gigabit Ethernet. A mode conditioning patch cord eliminates these multiple signals by allowing the single-mode launch to be offset away from the center of a multimode fiber.